The Baie-du-Febvre community pasture covers 326 hectares of the floodplain south of Lake Saint-Pierre. Its numerous marshes, wet meadows and swamps are subject to springtime flooding and provide ideal feeding and breeding grounds for ducks, fish, amphibians and muskrats. In 1992, the ministère du Loisir, de la Chasse et de la Pêche (now known as the ministère du Développement durable, de l'Environnement, de la Faune et des Parcs) and Ducks Unlimited collaborated on the Commune de Baie-du-Febvre wetland project, which was intended to increase wildlife productivity in a section of the territory, and especially to make the wetland more attractive to fish as a spawning and rearing habitat. Segment 1 of the managed habitat is a permanent marsh with a surface area of 38 hectares. Dabbling ducks use it as a staging area on their migrations, but also pair up, nest and raise ducklings in the marsh. Segments 2 and 3 include fish ponds bordered by vegetation, which shelters nesting ducks. 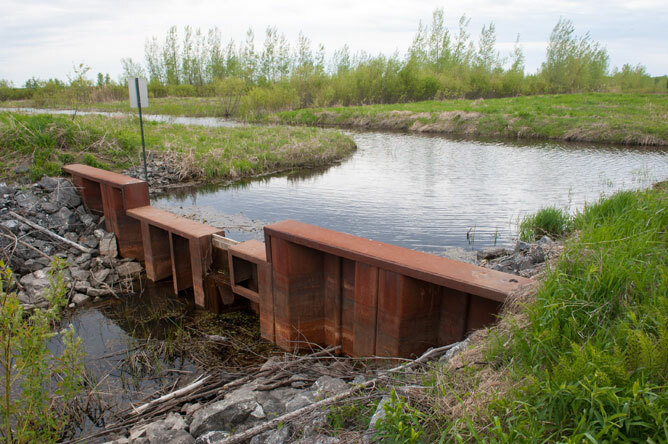 Over time, the Commune de Baie-du-Febvre wetland project deteriorated: sediments and emergent plants blocked off the fish ponds, creating a barrier that kept fish from returning to Lake Saint-Pierre after spring floods receded. From 2008 to 2011, a major project was therefore undertaken to restore 20 hectares of the site. The fish ponds were improved, water level control structures were added and some more ponds were developed. 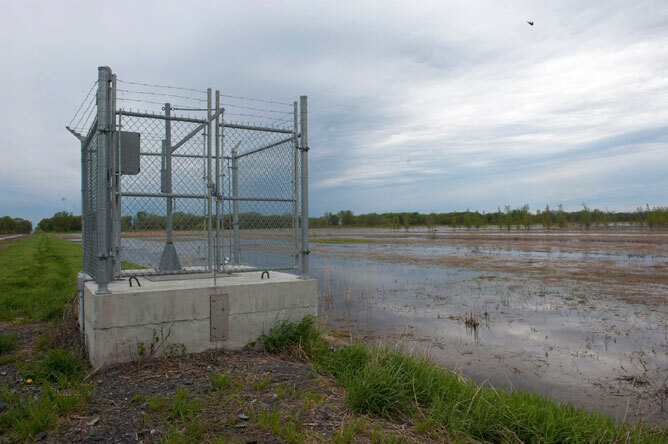 This metal structure, which is submerged during the spring floods, controls water levels in the Commune de Baie-du-Febvre wetland project when the waters recede, extending the period when these habitats can be used by wildlife. The structure locally compensates for the effects of lower water levels in the St. Lawrence. 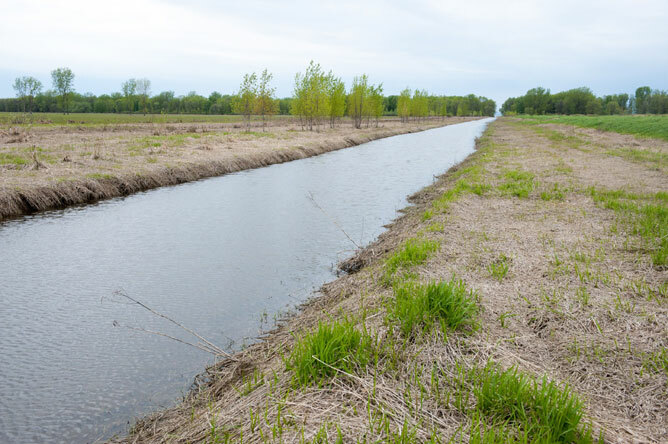 In 2009, a landscaping project was carried out on Travers de la Commune Stream, which runs along the southern border of the Commune de Baie-du-Febvre wetland project. The north embankment of the stream is covered in shrubs and herbaceous vegetation, which anchor the soil. 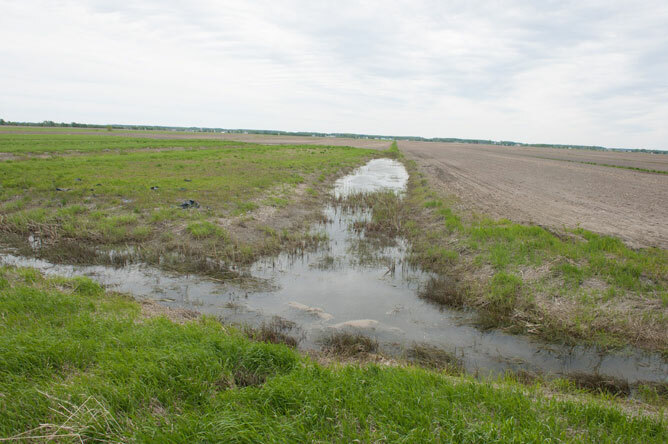 There is no agricultural land on the north side of the stream; however, the south side is bordered by arable crops (mainly corn and soy), and there was no buffer strip protecting the stream. This led to an increase in sediments delivered to the watercourse, lowering water quality and limiting fish movements. To mitigate the problem, the outlets of the 28 agricultural ditches that flow into the stream were cleaned and maintained. Accumulated silt was removed and a layer of shrubs and herbaceous vegetation was planted to anchor the soil. The vegetation also provides an ideal spawning substrate for fish during the spring floods. To stabilize the banks of Travers de la Commune Stream, 8,200 shrubs (red-osier dogwoods and sandbar willows) and 2,800 trees (silver maples and red ash) were planted. These species were selected because of their ability to resist long periods of flooding. 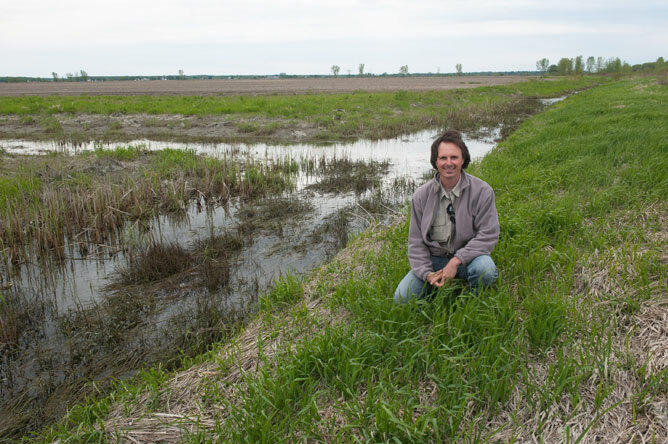 Conservation agreements were signed with farmers south of the stream, who agreed to set up buffer strips up to 100 metres wide on their properties adjoining the stream in the sectors most affected by spring flooding. Two landowners ceded the use of 27,475 square metres of land for conservation purposes. This was a great example of cooperation between agriculture and conservation. Biodegradable mulch was placed at the base of the newly planted trees and shrubs (darker material on the left side of the photograph) to keep other vegetation from smothering the young plants. Their trunks were brushed with repellent and covered in protective netting to deter mammals from damaging the bark. The agricultural ditches were redesigned with a more gradual slope. The ditches were also widened in certain places, creating ponds that are used by many ducks and fish. This photo, taken from the north shore of Travers de la Commune Stream, shows tilled fields and the expanded buffer strips created under the agreement. One can see the shrubs and trees planted along the river, as well as a pond built into an agricultural ditch. Since the 1950s, agriculture has intensified in the Lake Saint-Pierre floodplain. Hay fields and pastures have been replaced by fields of corn and soy. This change has deeply affected key fish spawning, rearing and feeding habitats. In 1981, the ministère de l'Agriculture, des Pêcheries et de l'Alimentation wanted to build embankments around the Baie-du-Febvre and Nicolet floodplains to increase agricultural yields. Environmental groups were opposed to this initiative. In 1988, an agreement was reached between local farmers and the Société d'Aménagement Récréatif pour la Conservation de l'Environnement du Lac Saint-Pierre (SARCEL). 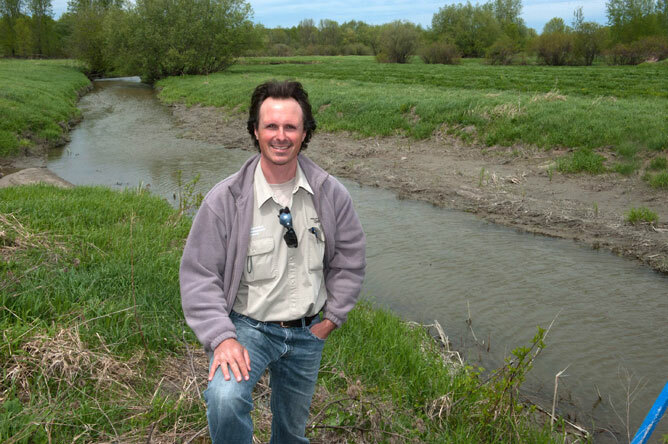 With financial assistance from the North American Waterfowl Management Plan (NAWMP), SARCEL was able to purchase 500 hectares of land. 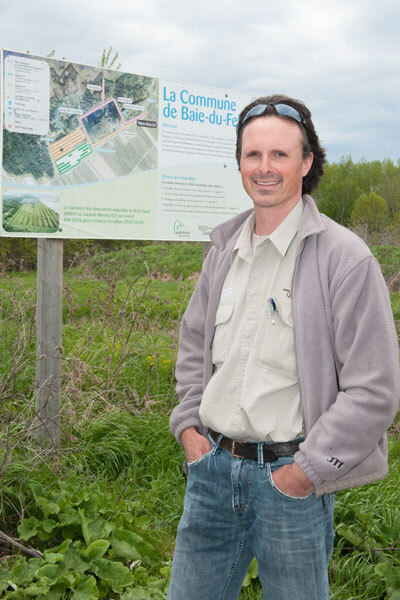 The ministère du Développement durable, de l'Environnement, de la Faune et des Parcs and Ducks Unlimited collaborated on a wetland project to restore fish and waterfowl habitat in a portion of the territory. Today, the Baie-du-Febvre/Nicolet-Sud wetland project includes permanent marshes (segments 3 and 8), natural fish habitats (segments 5, 7 and 9) and staging areas for waterfowl (segments 2, 4, 6 and 10), which are also used for agricultural purposes. Segment 1 is dedicated exclusively to agriculture. Waterfowl use the permanent marshes as staging areas and breeding grounds. During the spring floods, the marsh in segment 8 also provides spawning habitat for many species of fish, notably Yellow Perch and Northern Pike. 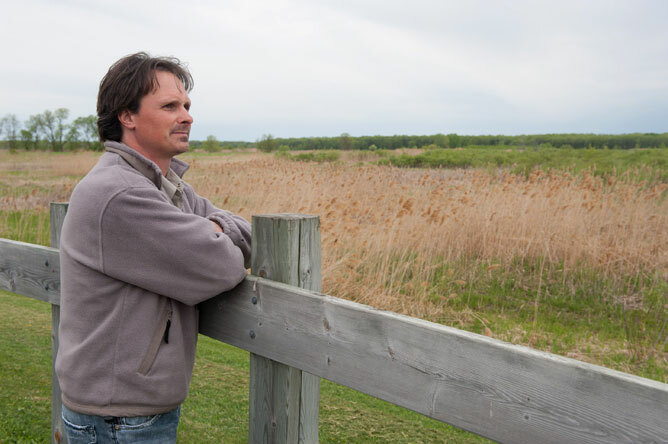 Philippe Brodeur, biologist at the ministère du Développement durable, de l'Environnement, de la Faune et des Parcs, at the rest area set up by the Société d'Aménagement Récréatif pour la Conservation de l'Environnement du Lac Saint-Pierre in front of a permanent marsh managed by Ducks Unlimited. In spring, when the river floods, segment 8 is covered by water. The site serves as a staging area for waterfowl and a spawning ground for fish. In late May, the water level is lowered, driving fish back into Lake Saint-Pierre. A pumping station regulates water levels to maintain the marsh throughout the summer. Here we can see an intake channel for the pumping station. It brings water from Lake Saint-Pierre to the wetland project dedicated for fish, waterfowl and amphibian reproduction. Certain segments of the wetland project focus on providing spawning and rearing grounds for Yellow Perch, a species in decline in the Lake Saint-Pierre region. Various monitoring and research projects are underway to assess how the fish are using these sites. Researchers collect eggs and fry, and monitor the growth and survival of juvenile fish. Research is also conducted into water quality and aquatic plant communities in this sector. Yellow Perch is seen as a symbol of environmental degradation in the Lake Saint-Pierre ecosystem. Restoring regular production of young fish to a sustainable level would be an important indicator of improved environmental quality. It is therefore necessary to intensify efforts to conserve and restore habitats in Lake Saint-Pierre, its floodplain and its main tributaries.